4Runner, which has become an iconic participant in the off-road vehicle class over the past three years, is built for outside activities. The modern Toyota 4Runner takes this iconic toughness to another degree with six different models created for greater longevity, increased comfort, and technical connectivity. This range of trim and engine options for purchasers or leasers in Westbury means you never have to settle for a 4Runner setup at Westbury Toyota that will not meet your preferences. Furthermore, maintaining constant driving while exploring uneven landscape is never an issue for whoever is within the driver’s seat because of the four-wheel drive system with Active Traction Control (A-TRAC), Crawl Control (CRAWL), and Multi-Terrain Select that takes care of wheel rotation. Bringing together all of these elements ensures you are willing to take to the street confidently. 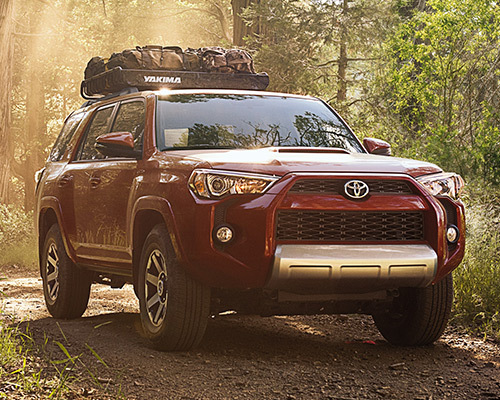 If you plan on getting everything possible from your next outdoor excursion, it is plain to see you need a 4Runner from %Westbury Toyota in your driveway. While the Toyota 4Runner has an untouchable reputation for owning the most daunting of trails, it also warrants plenty of credit for its stunning interior options. In fact, thanks to the inclusion of available heated and ventilated front seats, high-quality leather upholstery, active front headrests, and an optional moonroof, there is no lack of reasons why the 4Runner will turn heads just as much on the inside as it does on the outside. Do you and your passengers not deserve to enjoy the more exciting things in life when the time comes to buy or lease a brand-new mid-size sport utility vehicle (SUV) here in Westbury? Are You Ready to Discover Everything That Toyota's Spectacular 4Runner Trim Options Have to Offer? Constructed with the great outdoors at heart, the Toyota 4Runner Off-Road Premium has everything you must have to handle even the roughest of trails. Whether you are hauling up to 5,000 pounds (lbs.) or utilizing assets, like the locking rear differential and Hill Start Assist Control (HAC) to keep things moving forward, there is no denying this top dog has you covered when things get tough. The only thing left to go over at this point is whether or not you are ready to buy or lease one for yourself and truly take control of your automotive future. Enjoying the finer things in life has never been easier thanks to the Toyota 4Runner Limited. Whether you love this mid-size SUV's dual zone automatic climate control, power tilt/slide moonroof (which includes a sunshade), Entune Premium JBL Audio system, or any of its countless other noteworthy inclusions, the story stays the same: The Toyota 4Runner Limited is always your top choice if you intend on taking pleasure in an unparalleled combination of elegant amenities and rugged resilience. With the 4Runner TRD Pro at your disposal, you can move forward with certainty due to its unparalleled dedication to versatility and performance. 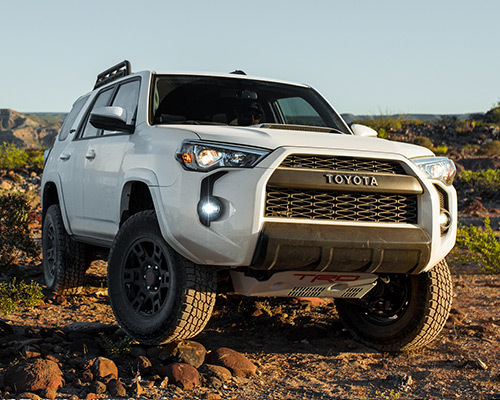 From a stylish (and practical) black roof rack to FOX shocks that lean on TRD-tuned front springs and premium LED fog lights, every single thing in the TRD Pro represents hardy endurance. This means you are always ready to show out and dominate the conversation, no matter where the roads (or trails) of Westbury take you. 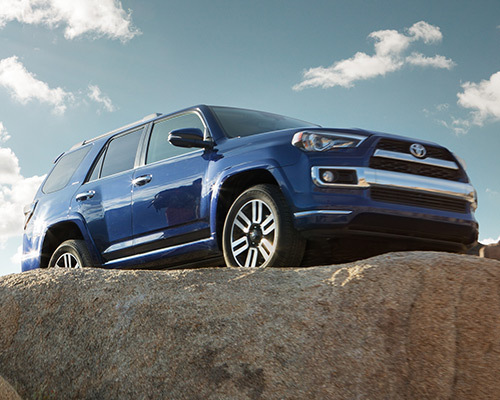 Traveling on numerous types of surfaces is no issue when 4Runner, the newest mid-size SUV from Toyota, is designed to run on 270 horsepower (hp) and a torque capacity of 278 pound-feet (lb.-ft.) through the standard 4.0-L V6 engine. Additionally, the towing capability of up to 5,000 lbs. gives you the capability to haul anything you intend to take on your sporting trips. Bringing your SUV in for routine upkeep plays a vital role in upholding maximum safety, which is the reason why a totally free two-year or 25,000-mile maintenance plan is included with your purchase or lease of the brand-new 4Runner. Additionally, asking for roadside help around the clock is fast and easy because of Safety Connect. Subscribers of this optional feature can also obtain help with retrieving their lost 4Runner and alerting emergency services should you be involved in an automobile accident. Nowadays, a lot of people usually do not set off without their cellular devices as a way to make certain they always have access to the world wide web, email, GPS directions, and to keep other types of communication available. Luckily, the Toyota 4Runner features Bluetooth cordless technology with futuristic voice recognition tech, turn-by-turn navigation (traffic and weather overlay), and the Entune App Suite to make use of mobile apps and bring up data via the 6.1-in. high-resolution touchscreen. These apps consist of Destination Search to find shops for gear, Facebook Places to discover nearby areas, and iHeartRadio to pick your chosen music channels. Wherever the trail leads you, your connection to the outside world is conveniently within your vehicle. All of the design factors and innovative properties of the Toyota 4Runner were carefully selected to ensure your off-road driving is a fun, secure, and comfortable experience. Mapping out the next endeavor has endless possibilities whenever you are driving the newest 4Runner. See Westbury Toyota in Westbury to buy or lease today.